I was in a motorcycle accident. 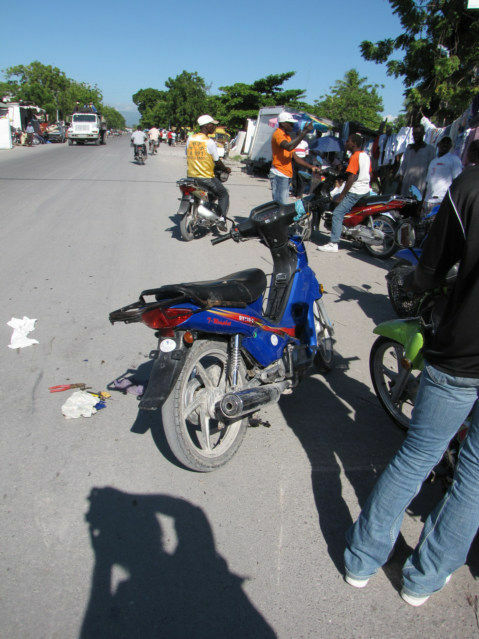 It happened in Les Cayes when I was on the back of a motorcycle taxi. 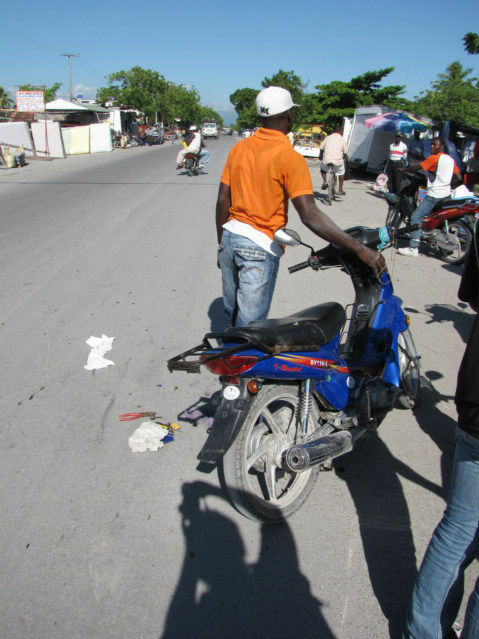 They call them Motos, and if there is an adventure to Haiti, it is the Motos and Traffic. I define Adventure Travel when a person has the possibility of being killed. I know readers want me to be kidnapped, or attacked by rebels; I am more likely to be killed in a motor vehicle accident. I went to the market, was walking back to the Hotel, flagged a Moto down, the driver was going very slow, being very cautious. Another very fast Moto passed us, and instantly crossed over in front of our Moto and parked his Moto. We tipped over to the left spilling all the tools and junk on to the pavement. When I hit the ground, I scraped my left elbow, and then pulled my leg over something sharp on the rear of the bike, making a three-inch minor cut. I may have come out this unscathed; except I was trying to make sure, I did not fall on my back where the camera was located. 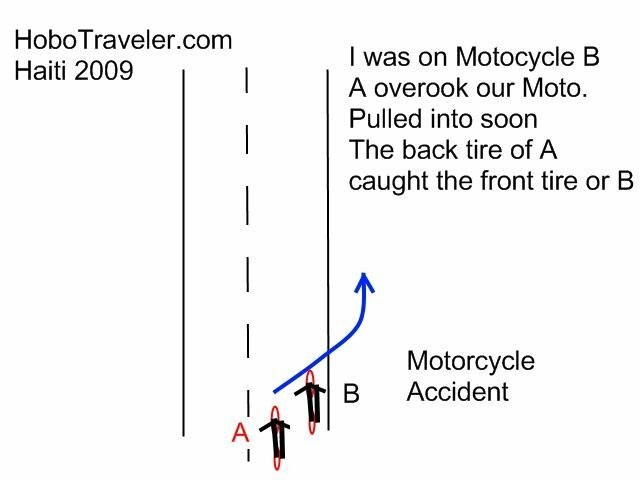 So what does Andy Graham of HoboTraveler.com do after a motorcycle accident, besides bleeding? I take photos, see my shadow, I had to do this very quick, the driver went over to argue with the other driver, if he was smart he would have secured the motorcycle to the side of the road, but that is not the way these countries work. He was angry, I was laughing, and everybody was losing their cool. I walked up the driver, pushed 20 Gourde against his chest until he took it, then walked on down the road. In situations like this, people do not react rationally. I needed to leave the scene, but I did not want him looking for me for 50 cents US, that is why I paid him. A sense of justice, right and wrong, what is fair is less developed, in less developed countries. The further down the primitive scale you go the more the excitement, there is nothing soft and gentle about these poor cultures. The people of Haiti are not helpless, they are ready and willing to protect themselves. Can a person from a developed country take care of themselves? Or is a person from an under-developed country like Haiti better equipped to deal with the world. Glad you're not hurt! Like the picture showing your shadow, very cool. Haiti sounds boring but dangerous. Not really a good combo. No dying allowed! If you die then I don't get to travel vicariously! JK, I am glad you are ok.